People always ask me, what's the difference between "copy" and "branding." My answer is: There's no difference between copy and good branding. It's copy and bad branding that are so different. Here is why: Good copy is not about you, or your product. Really. It's about the customer. What their life is like right now, and what their life experience will be like once they have your product, or use your service? That's what good copy is about. And good branding is really a condensed description of what your customers experience doing business with you. Your reputation in a catchphrase. Look at it this way. You know what a half-silvered mirror is? Where you can see through one side, but the other side is a mirror. Like you see on the back wall of an interrogation room on a detective show on TV. The bad branders hold the mirror side in front of their own faces. So the customer sees the brander, the marketer. The good branders, and the copywriters, hold the transparent side to their faces and point the mirror side at their market. So customers see themselves when they look back at the mirror. All of this gets back to the topic of today's episode, Including Yourself in Your Copy. As direct marketing copywriters, we have been sternly warned not to write about ourselves in our copy (or, write extensively about our clients when we're writing copy for someone else). That's mostly good advice, but there are some exceptions. I want to dig into what they are and how to use them, today. 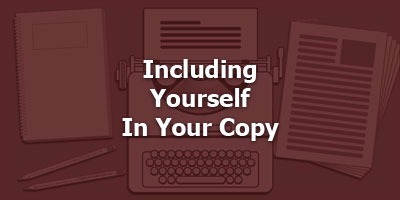 But first, I want to talk about you… and me… and copy. Now, let's talk about when to include yourself… when not to… and why. When I say "yourself" here, substitute "your clients" if you're a copywriter writing for a client. - long rants about your life that have nothing to do with what you're selling. Especially bitching and moaning about the injustices of life. This is copywriting, not group therapy via email. - your opinions, on politics, culture, sports, current events, and other external things. Now this can work in a post on your blog or on Facebook, to get people to know you and maybe start a discussion. But it's not going to help you sell anything unless it frames an argument related to what you're selling and your target audience shares the opinions you have that you have expressed in the copy. - information you think will "humanize" the copy, but actually detracts from the sales momentum. Personal info about you that ties into your offer is good – we'll get to that in a minute – but randomly trying to "humanize" your copy by throwing stuff about yourself from out of left field and into your writing is a very bad idea. - a long resume-like recital of all your credentials, degrees, certificates, trainings, and so on. Especially when they don't apply to your offer. You're trying to make a sale, not get a job! - your experience – as it relates to what you're selling. What have you done, seen, learned, that is important as regards the offer you're making? - They want to know if you know what you're talking about and what your track record is – is what you are selling, something you have competence in? - They want to know if you do your homework. That is, have you really done the study and had the experience to qualify as the expert you claim to be.